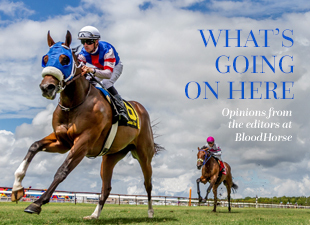 Interviewing an interesting player in the Thoroughbred industry is easy to do. Start with a rough outline of questions and most horsemen are quick to open up and opine about the horse business. It’s the writing and editing…whittling down the conversation into a cohesive feature piece that is the tough part. The task proves more difficult when the subject is Denali Stud’s Craig Bandoroff—not the questioning, of course, but the editing. We take our best shot with Bandoroff, and the story of his son, Conrad, readying to join the family business on page 28 of the March 18 edition of BloodHorse. Well, since the interview, Tapwrit (by Tapit), bred by Len Riggio’s My Meadowview and raised and sold by Denali for $1.2 million, won the March 11 Lambholm South Tampa Bay Derby (G2). Ticonderoga, another son of Tapit out of Keertana, bred by Bryant H. Prentice III and raised and sold by Denali for $850,000, won Gulfstream Park’s Palm Beach Stakes (G3T) March 4. Grade 2 winner Made You Look, bred by the Robert and Beverly Lewis Trust and sold for $360,000 as a Keeneland September yearling, ran in the Xpressbet Fountain of Youth Stakes (G2). “All three of them were in the same field growing up; and were in the same barn,” Bandoroff said in a follow-up conversation over the weekend. “Tapwrit: he was a $1.2 million yearling at Saratoga…he was always a nice horse. Early on we might have thought Ticonderoga would have brought more money at the sales. Around the barn his nickname was ‘Big Money.’ Chad thinks he is going to be a grade 1 horse. However, Tapwrit grew quite a bit and put it together in the summer. We fly our horses up to Saratoga—you don’t take one up there unless it’s a good horse, and you think it will sell well. And Bandoroff dreams of the day his son is a major part of the company. The dream gets closer to reality when he shows off photos of Conrad with both Ticonderoga and Tapwrit as yearlings in 2015. And dreams are easier to realize when horses are raised on some of the best ground on the planet. And the story, as are most tales in this business, is as rich as the soil itself. Regardless of what is written down and published, there’s always another angle—another lead, another quote, another phone call that could add further depth to a story. These Denali graduates have added their own exclamation points to this one.